“Verling Chako Priest, Ph.D. has channeled an extraordinary book. 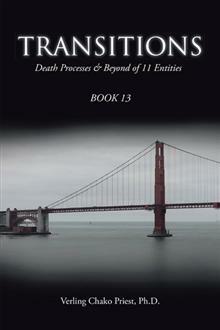 Eleven Entities who reside in Heaven come forth and tell their death processes and entrance into Heaven. Their deaths are varied from suicide, a broken neck, getting entangled in bramble-like scrub in the Outback of Australia and dying from dehydration, kicked in the head by a steer, being caught in an avalanche, and more. The death experience does not always involve a tunnel. Some of the Entities just become aware that a man is with them (Angel) guiding them to a Care Center where they are healed after sleeping a few days to a few weeks. Verling Chako Priest is a telepathic channel for the masters. She holds four degrees in higher education: two in psychology and two in transpersonal psychology. Transitions is her thirteenth book. Dr. Priest lives in Sun City Grand, Surprise, Arizona, and has been a channel for over forty years. A full list of Chako’s 13 books can be found in our “Recommended Reading” section on the Awakenedhearts.com website. I tell the group about the cover of my book. It is a photograph of the Golden Gate Bridge in San Francisco, CA, on a foggy morning. I asked the artist at Trafford Publishing to make the picture look haunting. I think she did a wonderful job using a black background. The bridge symbolizes a crossing on your way to Heaven. I explain to the group how Jeshua, et al, put what is called a Ring-Pass-Not around my energy field so that the Entities can enter no further. It is an energy band that puts a boundary around someone or something. This is used fairly often in the Heavenlies. As you read the book, you will see that that is one of the questions I ask of the participants. How were you brought to me and how far have you come into my field? Then they told of this energy band that would not let them come any further. The energy just kind of pushed them back a bit. As I had the different stories told to me, I wanted to see if there were certain dynamics I could identify as a constant—something that always happens. I am beginning to realize there is nothing as a constant, but there can be one that is fairly constant. The first constant is that after you die, you are taken to what is known as a Healing Center, or Care Center. One of the subjects had a favorite color of blue, so his assigned room was painted in blue. There is a comfortable bed and you are told by your Angel to take your clothes off because they can be bloody or dirty from your death, and climb into bed. There is an energy that just puts you to sleep so that your body can heal. You could sleep 2-3 weeks or months—however long it takes to heal the body. It is very important for those people who were ravaged by cancer to be healed. If you do not heal the damage the cancer has done to your cells and body, you can go back to Earth and that cancer will come right back into your new body. There are Entities—everyone is at a different level of awareness—but there are Entities that just bypass that Healing Center and go right back and take another body. That is when I say a constant is not quite a constant, it is because they do not bother going to be healed. And sure enough they go back to Earth and get their problem again. Therefore, I saw the Healing Center as a constant. The next constant I identified is the Life’s Review. No one can miss that one. That is an absolute constant. Even Sananda had a life review. It is in order to feel what your actions were, how they affected other people. Apparently there are choices as to how you wish to view the Review. Do you want to just watch it on a screen; do you wish to be in it and participate; or do you wish to just close your eyes and listen? I get such a kick out of some of these guys (subjects). This one man said, I don’t want to watch all of that stuff again; I want out of here. His Angel said to him, no, Sir, (the Angels call all the males Sir) you need to watch this. The man was being kind of a little brat and just closed his eyes, refusing to watch. What he did not know was the Review just kept playing behind his eyelids (much laughter). He could not avoid seeing his past life. And by the way, these buildings in Heaven are just gigantic and not necessarily do they have a ceiling to them. The surrounding grounds are just beautiful with flowers, grass and trees. The third constant I have identified is what I call the Group Process. (I am a Transpersonal Psychologist, and we do all of this processing dynamic.) When you think of Heaven, you are talking about another world or planet or realm. It is humongous, so there could be millions of people who died more or less at the same time you did. So they break up the number for the Processing Group with about 50 participants each. However, Sananda’s group only had about 12 people, as they were all Masters and on a different level of awareness. The Entities are congregated according to their soul awareness. You could be older or younger than someone else, but the souls are about equal in their growth. What was your soul’s awareness at the time that you had died? It was fascinating to me because there could be a group of souls who did not know they had died. The facilitator comes to the room and asks each person how he has died. (This is a male group.) The people finally get it. It is a light bulb effect. Oh my gosh, are we dead? Well ye-ah! I was interested in how the Bible describes different things—pearly gates, Saint Peter, streets of gold and so forth. Therefore, I asked the subjects, did you see all of this? They always said, no, it is an illusion. One of them tried to have this experience and worked up this illusion. But it was so over-powering for him that it was like walking into Fort Knox with all its gold. He could not stand the power of all that gold energy, so he just kind of backed away, and of course, the illusion disappeared also. Now I had asked Sananda this question because most of us know there is no Hell. That is an illusion of your mind and belief systems. So I asked him, is there a Hell? He answered yes and no. He said if a person when he dies thinks he is going to go to Hell that is his illusion; that is his belief system, so there will be a Hell there. There might be another person who comes forth who thinks in a similar way. So he joins that Hell with his illusions. Pretty soon there is this Hell with everyone’s illusion as to what Hell is. Then when the person, we’ll say, sees the light, he withdraws and his illusion is withdrawn also. So in that way Sananda can say yes there is a Hell because it is all illusion with everyone believing in it and no there is no Hell because it is an illusion. I was sort of at a loss as to how to give the subjects a code name because I had to be very careful with all the Legalese that could ensue if a relative recognized the Entity and took offense. Therefore, I decided to use the nursery rhyme of Rich-Man, Poor-Man, Beggar-Man, and etcetera. So I just followed that through. It sounds kind of ridiculous, but it seemed to work. However, with the sequel I have to say Rich-Woman, Poor-Woman, and Beggar-Woman, because I had to make the codes for females. The characters do not necessarily follow their code name. Everything you think of will manifest in Heaven; so you need be very careful of your thoughts. As for accommodations, you are given a choice. Some people want to be in a dormitory; others like a hotel concept. And still others like what I call a fraternity house. Later on, if you are going to be there for a while, you can build your own house. This one subject was from a wealthy family and had had a large house with all its amenities in his Earth life, so he chose to build his own little house. He said it was simple to build because if he did not like what he had built, he would just say whoosh, and it would just vanish and he would start over. Chapter #10 was Military-Man. He had been a Navy flyer in the military. One of the first things he did when he got to Heaven was to procure an airplane. I asked him if he had to file a flight plan; he said he did not have to, but he chose to because it gave him a destination. Heaven is so huge that he did not just want to get into a plane and fly without knowing where he was going. The subjects were just so real; I got a kick out of them. This one gentleman used the swear word of hell as slang. He would ask his Angel, where the hell am I? Or what the hell is this? Finally his Angel—each one has his Guardian Angel with him—his Angel couldn’t stand it any longer and said, Sir, you need to quit saying hell or you will end up there (laughter). That is about all I can say about the book. Are there any particular questions anyone would like to ask about the book? Q: Did any of them talk about after the fact, what they had learned if they come back again? A: I did ask them that. It is called retraining. Many of them were being retrained because some did not understand about reincarnation so they discussed that. They did a lot of retraining with religions because those are man-made edicts. A question was asked if one feels fulfilled in Heaven. She did not want to be bored. I asked Military-Man and he said for him, getting an airplane right away and exploring helped him. However, the other subjects had a fear that if they went too far afield, they would get lost and not be able to find their way back to their dormitory or their group. Most of them chose a dormitory, for they wanted to be around people. You start to see the levels of awareness with that. However, you continue to learn. I asked the subjects if they had a particular job that they were doing now. Some did and some did not. Military-Man said he could always have a job at Flight School because there were so many women who wanted to learn how to fly. Q: How long does the soul and the body stay together and what if the body is cremated? Q: Does everyone stay their same age or do they youth back to, say, their thirties? A: They youth, but they choose different ages. Some do not want to be that young. They may choose to be around 50 or 60 years of age. One of the subjects died when he was around 6 years of age. He said it was interesting to him because once he was out of his body, he seemed to know so much more than when he was in his body. He was connecting more and more on a soul level. He did keep growing in awareness to where he was supposed to be in his soul. He was very humorous and said, I am six going on to college. So you do keep growing; everything you do is a growth of some kind. Many of the people are into culinary foods, so they go and learn how to prepare different recipes. Of course, there is no meat or alcohol. They have what I call a food court that is open 24/7, and they can go any time and eat and drink anything that is available. They do not eat as they get closer into dropping their body. They do not eat as pure spirit. One subject has been in Heaven since the 1800’s. Eventually your Oversoul will nudge you to move on. You have to keep moving forward in order to grow and not just settle in to the good life. Therefore, you will have to return to Earth and have another lifetime. Q: Do they have choices as to how they died? A: They have contracts. What is a little different is that they have windows—I call them windows of opportunity. Say you have an operation. You live through the operation and live a while longer. Something else comes up and you die with that one. That is the second window of opportunity. So you have these different windows, but basically you and your Oversoul and all the players in the life that you are going to have had contracted—your parents, your siblings, your teachers, and your husband—had contracted to have this relationship and for you to die in a certain way. Q: Is there a final window or just endless windows? A: There is a final window. Q: How are they nudging the person who settled in the 1800’s? How do they get him motivated? A: That’s up to his Oversoul. I remember asking the subjects if they had seen any new inventions for Earth. They were told by the facilitator they preferred that not to be discussed, because if people described it inaccurately, it could manifest on Earth and be made incorrectly. So they did not even talk about it. Let it manifest in its pure way. You have heard many times how the Masters are pure unconditional love. Jeshua/Sananda certainly is. What happens to me is as he comes closer, it makes me well up, and I feel very tearful because he comes right into my heart. It doesn’t make any difference as to how big or deep your heart is, it is the unconditional love coming into your space. It affects me and most likely all of you. Good morning to my precious group. Some of you are new and may not realize that we Masters have taken this Wednesday group under our wing, so to speak. Therefore, we are very much interested in your growth. On Wednesday when you meet, we do a little tweaking of your energy. Any little thing that needs adjusting, we do, but it is always with your permission. I just wanted to let you know that just because two of the previous facilitators—Ziranna and Mary Helen—have passed on, this group is still very much in the arms of all of us Masters. I would like to do something just a bit different. Chako and I were discussing this. I would like to recall one of the Entities so that you could ask him your questions about Heaven. That is Military-Man, for he seems to be the one who loved to explore the most. So let us see what he has to say. Hello to everyone. Thank you so much for having me back. I have so much I could tell you, yet I do not wish to exceed my time limit here. I think I will just open it up to questions and let you kind of shout it out, and I will tell you what it has been like for me. For those of you who have not read the book yet, I was 88 when I passed last year, 2014. I have always loved airplanes, so I immediately got myself a plane. I wanted to hone my flying abilities. I asked for very stormy weather. In that way I could fly through it and keep my plane up. Of course there are no crashes here, but my Guardian Angel is always with me, and we have had some very harrowing experiences. I know I can’t die up here so it is kind of fun (chuckles). I did not have all of that much fear when I had my Earth body, but this is even more fun. Now does anyone wish to ask me something? Q: How old are you now? Q: Have you made the decision whether you will fly again in your next life when you come back? A: Yes, I have. I am going to reincarnate, and I will be a flyer again. Each year, you see, the planes improve. There are some wonderful, wonderful planes. I had a little trepidation in that lifetime, because I did not like landing on an aircraft carrier. I must say that kind of scared me, but I persevered and was able to get my wings. Then I went into multi-engines and flew planes that had more than one engine. But I will go back and get into more modern aviation. Q: When you come back, will you decide to come in as a walk-in, say at 23, versus as a baby? A: I have thought of that but have not made up my mind yet. I do not know if all of you understand what she was saying, but you do not always have to return to Earth through the human baby canal. You can be a walk-in. You make a contract with a soul who wants out of its body and you take over that person’s karma. Q: When you come back, have you made the decision whether to come as a male or female? A: I will come back as a male. I prefer that energy. Q: Are there consequences in coming back constantly as one gender versus trading off? A: There are no negative consequences. However, perhaps boredom could come in for always having the same energy. When you change genders, that creates an entirely different set of studies and experiences. I am an old soul and have been a female before. Most of you have changed genders also. Q: Have you connected with any of your past life incarnations or are interested in doing so? A: I was asked that in the book, and I have not connected with any of them. It is kind of amazing because there is no time as you know it here. Consequently, it does not make that much difference to me anymore. Q: Are you surrounded by family members? A: No. I chose not to. It is a choice. (Much laughter) You are kind of giggling about that, but it was not a negative decision. It was simply that I had other things to do. They had their different ideas of what they wanted to do and not every one of them was as much of a fan of aviation as I am. Q: So your contract with them was over? A: Mostly, although if I wished to reincarnate, there might be family members I need to hook up with again, simply to finish a segment of the contract. Q: Are you mostly surrounded by people of your level of awareness? A: Yes, almost always. Chako asked different subjects in the book if they had seen any of the Ascended Masters. Most had not because their level was not at a level to be connected with say, Jesus/Jeshua/ Sananda. That was one of the things that I was shocked about when I passed—to find out that my wife had a very deep connection with Sananda and I had not realized that. Q: Is your wife with you? A: No, she is not; she is still living. I had two wives and they are both living. Q: Will you tell us some of your experiences as you explore Heaven? A: Yes. This area is so vast that I certainly did not have any idea of it. And I imagine most of you do not have an idea either. As I said, it is another planet; it’s a realm and it’s a world. How many of you have explored all of Earth, you see. It is the same concept. Outside of practicing being in stormy weather, I have been to two oceans; I have been to forests—places like that. Q; Comment: In Heaven you can go everywhere, while on Earth you are limited by money or family obligations; do not have the time; can’t leave your job. Q: Can you be in more than one place at the same time? Q: You have dropped your body, right? A: No, I have not dropped my body. I need my body to fly. You are not pure spirit flying an airplane. I like to practice. I like the stormy weather. Q: Were you in the military as a pilot? A: Yes. I was a pilot in the military—the Navy. Q: Are you able to explore other planets and Universes? A: I am not at that level of awareness simply because I would need to be in that spirit body. If and when I drop my body, I can then go to other Universes and other planets and if I have reached that level of awareness. Q: What dimension are you residing in? A: Heaven is in the 5th dimension. When I passed, I had some fear because I did not know what to expect. Many people think the worst of themselves—they’ve been ultra-bad, or something like that. I found that it was not as bad as I thought it was going to be. In fact when I entered Heaven, the unconditional love was just so overwhelming, so encompassing that it took away any fear of not being good enough. There are no lesser Gods in Heaven. Everyone is equal. Q: How many past lives have you had? A: I have had 46. Q: Are you tired (laughter)? A: No, actually, I am not. Q: When you made your transition, was it peaceful? A: It was peaceful, but my 88-year-old body was not in very good shape. I had COPD and could not breathe; I had neuropathy and could not walk. I struggled a lot, and they gave me morphine so I could breathe more easily. The wonderful part about it was that when I did pass, my Angel just pulled me out. I do not think you realize that your Guardian Angel is there to help you release. Look for his hand and grab it and he will pull you out. Then I was exploring everything because it was all so different. There is no more fear because you are just feeling love. Q: When you transition, do you automatically forgive everything that you had created in the past? A: That comes up in the review. Then again you are retrained in the Group Process room. During that time, the facilitator does talk about forgiveness. It is a basic reality that forgiveness and love is a potent equation. Q: Do you think of it as an interruption when you are brought to a group to tell us of your experiences? A: I do not think of it as an interruption; I thoroughly enjoy it. It is like another adventure. Oh, what’s going to happen now? I just enjoy it. And I thank you for putting up with me. Q: Were you aware of all of these potentials of coming and going, to visit us and so forth when you were alive? A: No. My wife was into all of that but I wasn’t. The more she got into it, the more I fought against it. You know how it goes (laughter). Q: Do you from time to time check in on your children to see how they are doing? A: Yes, I do. That is another thing, you see. We are taught in the Group Processing room that it is now time to let go. Do not stay attached for any particular reason. Now if there is a contract where you are going to be the guide to maybe a son, of course you would still be in contact with him. However, basically, when one dies, that is a letting go, and it is finished. Q: What, if any, has been your experience of when you passed that maybe someone on Earth could not let go of you? What is that experience like on the other side? A: That is like… Have you been in a swimming pool and you are trying to climb up the ladder to get out and some kid is hanging on to your swimming trunks and keeps pulling you back into the water? That is what it feels like—that pull. They, too, need to let go because when you don’t let go, you are wanting to continue that relationship and you cannot. It is finished; let go! You can always send them love, blessings, and Light, but let them go, for they now have another life in Heaven, just like you have another life on Earth. Q: What about when you are here on Earth and are about ready to go but you are hanging on, hanging on, hanging on? Does your Higher Self say let go! A: That becomes a lesson in itself. Many people who are dying keep hanging on to that body until the body just dies out from under them. Then when they get to Heaven and are being retrained, they address the issue as to why they could not let go. What were you afraid of? It is a whole other dynamic of different reasons. Q: When you are in Heaven, can you actually cut the cord or do you have to allow them to do it? A: That can be either way because it all depends on the circumstance. If you cut a cord, say, to a child who is grieving deeply, that would not be a kindness to that child. So that is what holds you to Earth. When the child has grown up and maybe has children of his own, then he may cut the cord but not in the way you may think like chop, chop, chop. It just sort of dissipates so there is not such a pull any longer. Q: Is there anyone pulling on you at this time? A: No, they have let me go. Q: Are all current lives based on lessons you need to learn from a past life? A: Yes, they can be, but also it is based on growth. You are searching for growth—anything that can grow you. Just like for me and my airplanes. When I am in this fierce weather, that is a growth for me. It might not seem that way to other people, but on a soul level I am growing, you see. A: Because each time I succeed, that is a growth. I have not gone backwards; I have gone forward. Q: You decreased your fear, maybe? A: Yes, that is true. You see up in Heaven, I have very little fear for I know I cannot die. I am just honing my skills. Q: Do you make contracts with people when you come back to visit? How do you do that? A: No, I do not make contracts at that time. In my case, I have just been approached by Jeshua/Sananda about this book and asked if I would consent to be one of the subjects and I agreed. Q: I think she meant when you come back for your next life. A: Excuse me. There is always a contract when you take another life because everybody is involved. You have got parents, teachers, siblings. Everyone is part of that contract. Q: So let’s say you have fulfilled your part of the contract but maybe the other person has not. Do you have to return and do that again? A: In some way you have to return and play that out, but not necessarily with the person who has already done it. Yes, you can say, I did not finish it, I now want to. But since the other person did, she can choose whether to play it out with you again or not. I then need to finish that segment with someone else. Q: In your very first lifetime, how far back was that? A: I went to another planet. Q: Do you remember what you were there? A: I was a male; that is all I remember. Q: Thank you for your service. Do you have a burning desire to recall all of your past lives, or do you sort of just let them go? A: You are most welcome. No, I do not have a burning desire to keep looking at my past lives. I can do this at any time that I wish. I go to the big room where you can ask for a particular past life that you had and look at it all over again. It is in the category of been there, done that, and I have no desire to just dig it all up again and look at me all over again. So do you feel finished with me (chuckles)? Thank you; it has been great fun. I hope I am invited back again—maybe for Chako’s sequel. Maybe they can work me into the Appendix. I thank you so much and greet you and bid you good day! I am Sananda again. We thought that would be a little different for you and give you information, say, from the horse’s mouth, as to what is going on up there in Heaven. You do realize by now that I am not religion in any way. I am pure unconditional love. I try to forget some of that religion, but humanity won’t let me. They are always putting me on the cross or something with my image which half the time is not true. I bless all of you; I keep you in my heart, and I look forward to seeing you next Wednesday, for I am always here. Namaste. Jean Alexander does a powerful toning setting the energies in a positive way. This completes my Presentation of Book 13. Kids Corner #21 What is Energy? Kids Corner #20 Why am I here? Kids Corner #13 What You Believe – Creates Reality!